Published in 1940, the title of a Thomas Wolfe novel suggests “You Can’t Go Home Again.” But perhaps you can. 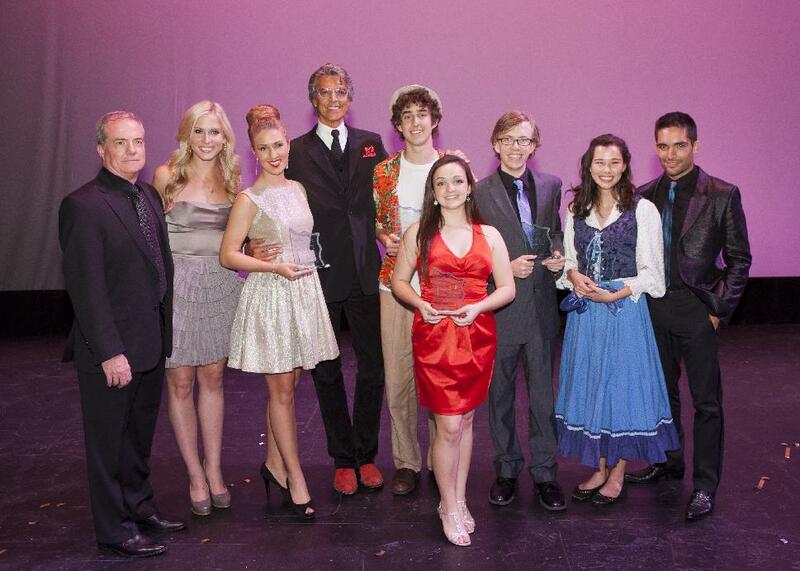 It was a homecoming of sorts at the recent 10th anniversary Tommy Tune Awards presented in the grand Sarofim Hall of Houston’s Hobby Center, and sponsored by The Brown Foundation, Inc. and Conoco Phillips. Broadway legend Mr. 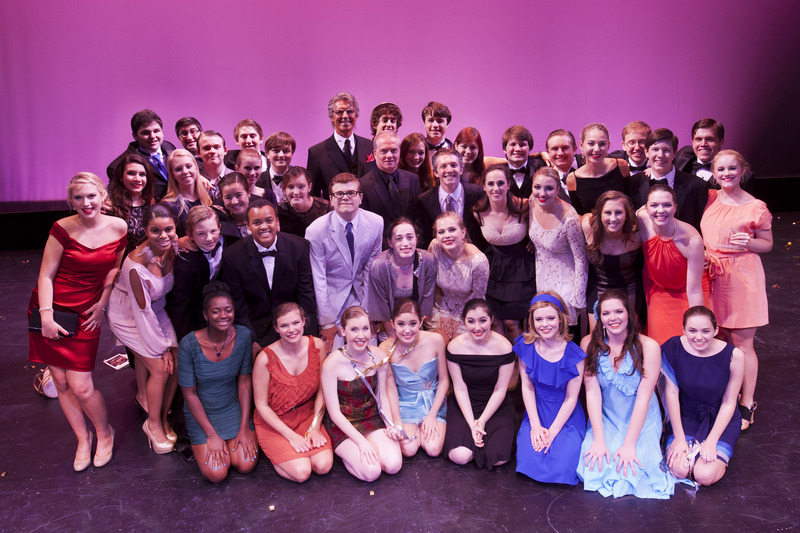 Tune, himself a nine-time Tony Award winner, was on hand to assist in honoring the year’s outstanding actors and musical productions representing 44 high schools throughout the Houston area. As in the past, it was to be a memorable night of what Mr. Tune correctly described as, “magic, energy, talent and excitement.” Correct on all counts! Even before the show began that energy was bubbling over from the largely youthful sell-out crowd, and it would be enthusiastically on display with the announcement of every award and scholarship. Family and friends packed the house with many in formal attire, and local media was visibly on hand as ABC Channel 13 cameras recorded the event for later telecast on Sunday June 3rd from Noon until 2 p.m. The opening number, “It’s Not Where You Start,” starred the night’s nominees for Best Lead and Supporting Actor/Actress performing the song from Seesaw that won Tommy Tune his first Tony Award. Dressed in elegant black, the cast launched into such a rousing performance that it gave one chills to see and hear such musical theatre excellence. Theatre Under the Stars President and CEO, John Brackenridge was certainly justified as he spoke of the pride his TUTS team feels in having reached this tenth anniversary celebration of the awards program. Meanwhile, Jim Bernhard and Ayana Mack presided as emcees for the evening. Now in his 70’s, the tall, handsome, and endlessly youthful Mr. Tune came quickly onstage at the outset, and once again he charmed his young audience. Wearing elegant red cowboy boots fitted with taps, he wowed the crowd with a few fancy steps before joking, “I’m older and taller than I ever intended to be.” The crowd roared approval. Also a talented artist, Tune told the crowd that each award winner would receive a framed and signed print of one of his splendid watercolors. 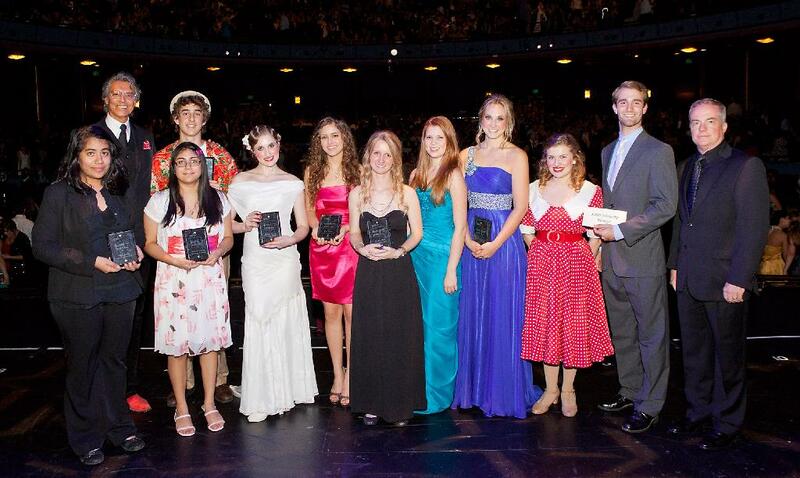 As the evening continued there would be production numbers from each of the eight schools competing for Best Musical. – A glittering performance of “All That Jazz” from Chicago by St. John’s School. – A spirited and fun-filled “Brotherhood of Man” from How to Succeed in Business Without Really Trying by Klein Oak H.S. – A classy medley from The Drowsy Chaperone by Kingwood H.S. – The medieval charms and merriment of Once Upon a Mattress from Klein H.S. – A stunning “Wil-a-Mania” from Will Rogers Follies by Stratford H.S. – A rollicking “Once A Year Day” from Pajama Game by Friendswood H.S. – A riotous “Great Big Stuff” from Dirty Rotten Scoundrels by Episcopal H.S. 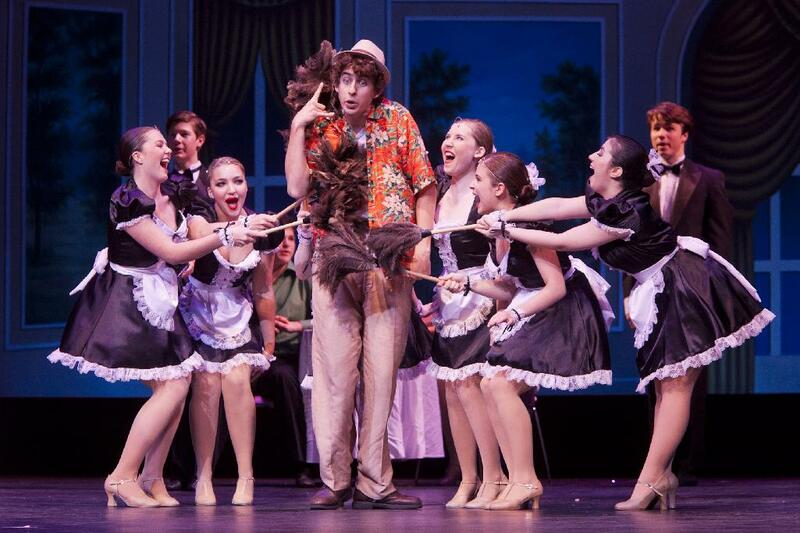 – A high-energy “Toledo Surprise” from Drowsy Chaperone by Clear Springs H.S. In the end, Episcopal H.S. 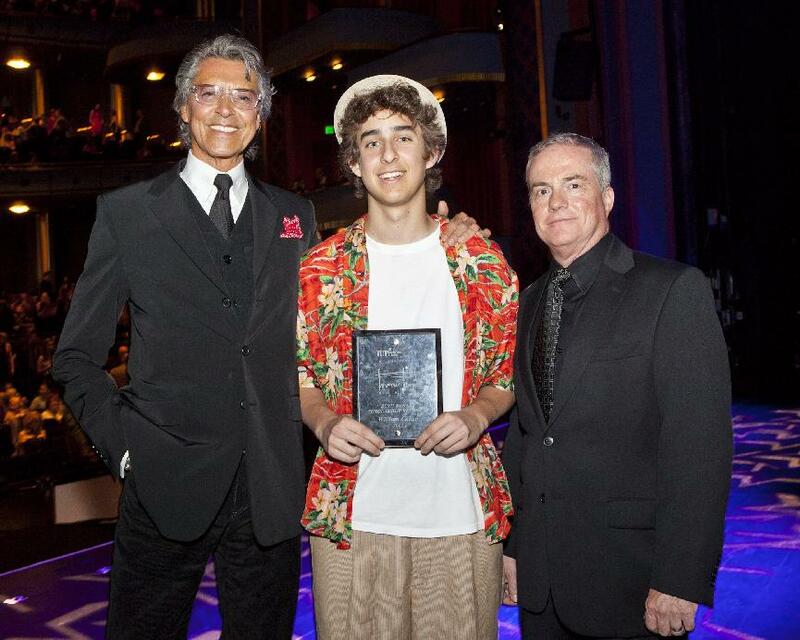 would triumph with “Best Musical” for its delightful Dirty Rotten Scoundrels, and there were countless other awards and scholarships that are recorded here in the accompanying lists. In addition to the nine scholarship winners listed here, the prestigious Ruth Denney Scholarship carried an increased stipend of $5,000.00 and is named in honor of Tune’s mentor and legendary Lamar High School drama teacher. He seemed almost on the verge of tears describing what a life changing influence she had on him when she told him years ago, “Tommy Tune, you are different and that’s okay, because it means youare an original.” The Denney Scholarship was presented to Billy Cohen of Episcopal High School. Other highlights of the gala evening included an Act Two video montage of clips from productions of each competing school, and a complex, original and fabulous medley of show tunes from first the group of Best Leading Actor nominees, and secondly the group of ladies nominated for Best Leading Actress. Maestro Moricz orchestrated those two numbers, as well as composing the elaborately choreographed Finale, “Eyes on the Goal,” The latter featured a cast made up of two talented youngsters from each of the 44 schools. How in the world Mr. Moricz and the show’s brilliant Artistic Director, Michael Tapley, were able to so successfully rehearse and prepare this stunning production with students from such a wide-ranging area will go down as one of the great mysteries of the age. Both she and Mr. Cohen will now go on to Broadway as their reward for winning top honors here. With TUTS paying all expenses, they will participate in the National High School Musical Theater Awards and compete for the coveted 2012 Jimmy™ Awards to be presented at the Minskoff Theatre in New York on June 25th. I hope to attend. Additional Scholarship Award Winners include Alma Acosta (Elsik High School), Monica Brown (Kingwood High School), Kate Court (Pearland High School), Elisabeth Del Toro (Friendswood High School), Nathaly Garcia (Elsik High School), Haylee Hoelscher (Houston Christian High School), Jeremiah James (Cypress Ranch High School), Shelby Stark (Klein High School), and Eleonore Verkerk (Stafford High School). This entry was posted in Broadway, BroadwayStars.com, HERE HOUSTON-Lifestyle & Entertainment, HERE Lifestyle & Entertainment, Houston Community Newspaers online, Miscellaneous Reviews, The Courier Columns, The Villager Columns, Theater Reviews, ThePeoplesCritic.com and tagged Broadway, Celebrities, competition, contests, Entertainment, Houston, musicals, plays, Reviews, Texas, theatre, Tommy Tune Awards. Bookmark the permalink.